The making of a great beard. Where does it begin? Garrett shares the story of how he came to grow a full beard despite substantial cultural conditioning to the contrary. A beard-growing pioneer among family and friends, Garrett’s independent thinking led him to grow his full beard — in the heat of summer, no less! Read the story of the making of Garrett’s great beard. Then be sure to visit Garrett’s photo album. Do you recall your earliest memory of beards? In other words, do you remember when you first became aware of the existence of beards? Can you describe that memory? I can’t remember the first time that I noticed a beard. I am sure that it was on an actor. I seem to remember facial hair in general correlating to the more masculine characters, even if it were just light stubble. So I think that my earliest memory of facial hair would be its correlation to masculinity. In childhood or adolescence, did you ever have the feeling or desire that one day you would grow a beard? Like many boys, I can remember wanting to shave — but not after growing facial hair, of course. However, the ability to grow facial hair meant that you were becoming a man. Then the facial hair came and I hated it because of the “need” to shave. In high school I really did need to shave. Facial hair violated the uniform policy. Then you become used to the pattern. I don’t remember wanting a beard in the beginning, but I do remember wanting that full stubble look. At what age did you start shaving? Did you view this as a personal milestone? If memory serves me correctly I was thirteen. I was very proud that I was maturing. I had skipped a year in school and was the youngest in my class. In my mind, it prevented me from being viewed as the young guy in school. Did anyone in your family or among your relatives have a beard? Did that have an influence on your perception of beards? I cannot think of anyone in my family with a beard, at least not during my lifetime. My father has a mustache that he grew just after I was born. I think this helped to propagate the thought that shaving was something required by society. Did anyone else serve as a bearded role model for you? This could be a famous figure, a relative, friend, or acquaintance, etc. served as role models, though. Before you could grow a beard, did you ever see a man with a beard and feel any sense of beard envy? I think this was more before I grew a beard than before I could grow a beard. It has been in the past couple of years that I have really wanted to try growing my facial hair. I very much like the look and wished that I could have some kind of hair on my face. I just would give myself the normal arguments about how I didn’t have enough facial hair to grow a beard or goatee or mustache. You mentioned that you weren’t sure if you could grow a beard. What gave you the confidence or motivation to try growing your beard now? What was the growing experience like for you? Did you come close to abandoning the effort? If so, why? If so, how did you overcome the urge to give up? It was fairly normal for me to not shave for 3-4 days. I liked the look of my face with stubble and I hated shaving. Then, once the point would come that the stubble started sticking out and turning into hair, I would repeat the cycle. I did this many times because it would itch, especially while trying to fall asleep at night. Work was also a reason to shave. It doesn’t look very professional to just have a completely unkempt face. This time I made it past the normal four days or so and started to get curious. A big part of my sticking with it in the beginning was being complimented by some of the people that I know about how I looked with facial hair. That made me curious to see what it would turn into. Not everyone liked or likes it, but I figure not everyone could possibly like my face without hair. I came very close to shaving during my pattern cycle, near that four-day window. The next thoughts of shaving came at about the two-week mark. That is when the people that didn’t like it finally realized that I was going to keep that beard and had to throw their two cents into the conversation. And the very rapid growth that is easily seen in the beginning seemed to be slowing down. The hair didn’t seem very full at all. Then I started thinking; I didn’t know at all how long it should take to grow a beard. 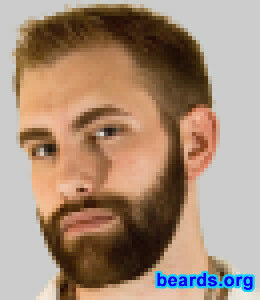 So I turned on the Internet, Google, and typed in “Beard Growing”. That is how I found this site. The information here gave me the boost that I needed to hold on longer and see what I would get. Now that you’ve grown a superb beard, how do you feel about it? with the beard. Many people just seem to attach age and maturity to a beard. What kind of comments have you received on your new beard? If you received some critical comments, how do you feel about them? What helped you to stand firm against criticism? Do you think that the comments had any validity? Most have been positive…everything from “That looks very nice on you” to “Can I touch that? Wow, that feels great!” My aunt doesn’t like beards, so I heard from her, “Men with beards always look like they are hiding something. You have too nice of a face to cover with THAT.” I try to never really care about what people say. If everyone I knew had hated the beard, then I probably would not have grown it, but now that I have it and know that I like it, they don’t matter to me. The validity that some comments might have is really just a matter of opinion, so there is no point in taking those things to heart. Not everyone likes a man with a beard. I will never change them, but they can get used to seeing it. As of now, have you given any thought about remaining bearded permanently? Or do you think it might become an occasional thing? Or, could you see yourself permanently reverting to a clean-shaven state? I won’t revert back to being clean-shaven. I will try it permanently until at least next April. Now that I have a beard, I might as well keep it through winter. I do wish that I had not chosen to grow a beard in the middle of the hottest summer in my lifetime. Then, depending on how I feel about my beard, I might only have stubble through the next summer. But we will see. For a clearer view and to see more photos, click on the image to go to Garrett’s photo album.